Eat, drink and feel even merrier with 12 smart swaps. Every little saving helps offset the damage! 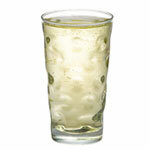 Swap your usual glass of white wine for a Spritzer made with soda. A longer drink means you won't have quite so many.....in theory! ;-) Hic! 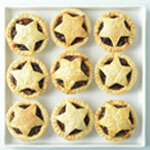 Swap the heavy pastry top on mince pies for a thin star shape instead (or go lid-less to be even more saintly). Over the festive season it could save a few hundred calories! ). Swap premium brand Kettle Chips (251 calories for 50g) for a 'lighter' option. 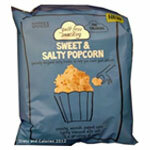 Our favourites are the Guilt-free Snacking range from M&S - loads of tasty choices, Walkers Sunbites and Walkers Bakes. Swap your dinner plate for a small one. It's natural to fill your plate, so a smaller size means less food so fewer calories consumed. Don't like the idea of a small plate? Remove one of everything. Have one less roast potato, one less roast parsnip, one less pig in blanket and fill up the space on your plate with green vegetables. 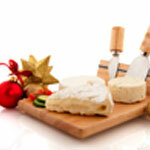 Swap double cream or thick and creamy custard on your Christmas pudding for a 'light' version. For an even lighter option, try a dollop of low fat natural yogurt or half fat crème fraiche instead. 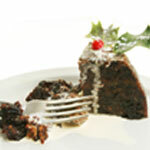 Swap Christmas pudding with brandy butter - a staggering 550 calories - for a lighter dessert. 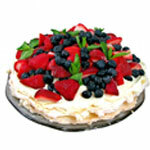 Try a Fruit Pavlova - around 200 calories a slice*. Save calories and feel less stuffed! Swap the after-dinner Bailey's (200 calories and 7g fat) for a Cosmopolitan cocktail instead - around 130 calories and zero fat. 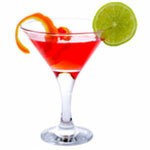 Here's what you need....25ml vodka, 25ml Cointreau, 25ml light cranberry juice fresh lime juice, slice of orange. Swap cheddar on your cheese board for a reduced fat option. After a calorie laden meal, ask yourself do you really need it at all? 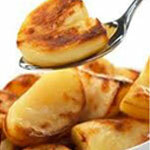 A small chunk of cheddar (50g) adds an extra 210 calories and 17g fat! 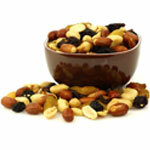 Swap open tins of sweets for small bowls of fruit and nuts. Just 4 chocolates (which it's too eat when passing) contain around 170 calories compared to a small handful of dried fruit and nuts which comes in at approx 110 cals and 7.5g fat per 25g serving*. Plus nuts provide good fat. Swap the traditional trifle -around 400 calories and 25g fat per serving for a healthier version of Eaton Mess. 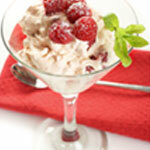 Crush a meringue nest into an individual glass dish; mix with 50ml whipped cream and top with 150g mixed berries. Very quick to make. 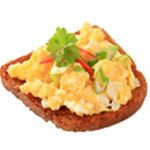 Swap the bacon sarnie at breakfast (500 calories and 25g fat) for scrambled egg on wholemeal toast - around 350 calories and 19g fat*. Better still, have fresh fruit with low fat yogurt and a sprinkling of granola - only 250 calories. Okay this is a tough one so we'll let you off if you don't manage it! Swap the post-lunch snooze for a quick walk. 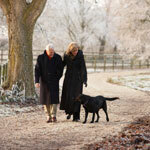 30 minutes brisk walking burns 140 calories - that's 3 Quality Street chocolates OR a glass of wine gone! Plus you'll feel less sluggish. In theory, you might make all of the above choices on Christmas Day. If you were to make all the swaps, you'd save a whopping 1,510 Cals. All the little savings add up!